Entrepreneur, software developer, management consultant. He made his own alarm system for his room.Subscribe to his musings. 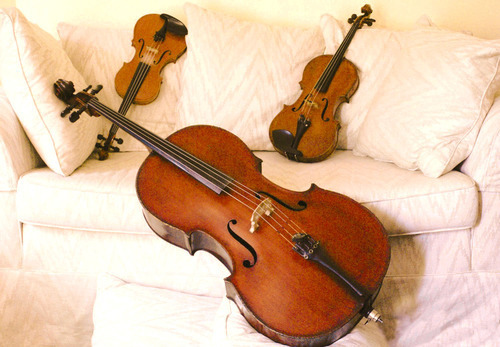 I’ve recently started a new String Trio (violin, viola, cello), tentatively called the Marcato String Trio. Today is our first practice and we potentially have two weddings to play at next summer! In my About Me - Music section, I talk about loving the viola because nobody ever plays it, and yet it is required in every trio and quartet (and orchestra for that matter). It’s an amazing niche market, and if your arms are slightly longer than average, you should definitely consider it - even just on the side to your violin career. It’s a really cool feeling to be musically in sync with other people - staying in harmony and producing music that some genius hundreds of years ago wrote. At the same time, I’m able to remember all those experiences I had growing up playing music - marking down the correct bowings, jumping back in after screwing up, and doing the little sniff before everyone starts playing. I like to think that skills in other aspects of life are transferable to your professional life. In music, a successful ensemble will work through their errors together, systematically practicing the difficult passages and asking each other for opinions and suggestions. That’s the kind of startup I’d like to work in too. Everyone has their own part and everyone pulls their weight, and we bring it together to make something that is greater than the parts. Music is one of those realms where it’s easy to watch and learn from others - in fact, it’s almost expected if you want to get better. I think I’ll try to do that in my work life more - observe others from a perspective of pure learning, without judgment or bias. And be inspired by them - we are also talking about potentially playing something from My Neighbour Totoro which would be difficult, but fun!